complex social systems and spiritual concepts. The first art that we can recognize appears in association with the remains of fully modern people. These people were just like us, although their lifestyles depended on hunting and foraging for food or, later, on pastoralism and subsistence agriculture. It is possible that earlier peoples might have decorated their bodies and clothes or marked trees or features in the landscape but, if they did, evidence of their art has not survived. Recognizable art dates from at least 38.000BC in Europe. Africa, and Australia. There are also controversial claims for rock art of similar age in South America. Works of this early period are not simple. They do not show development in the manner of a child's drawing, that is, gaining competence and accuracy in realistic representation before perhaps achieving a more mature confidence for abstraction. Instead, the oldest known works of art, including paintings, sculptures, and engravings, seem to show all these qualities at once. They are the products of minds as intellectually capable and sophisticated as our own. In Europe and Africa, early works of art depict animals and humans and include symbols. The former may be drawn or sculpted realistically or represented by the clever emphasis of a distinctive characteristic, such as the tusks of the mammoth or the horn of a rhinoceros. Paintings, low relief sculptures, and engravings adorned areas of caves and rock shelters where hunter-foragers lived. They also covered dark caverns and recesses visited less frequently where light from fires and lamps illuminated occasions which probably had special social and spiritual significance. With the spread of farming as a way of life, people began to settle in villages, and territories were defined. Drawings like maps and landscapes appeared, along with domesticated animals and more human figures. Changing styles of decorated pottery became the designer labels of successive generations of prehistoric peoples. 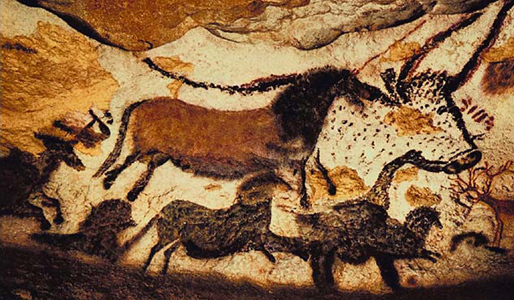 Of all the known prehistoric works of art, some 70 per cent may be attributed to hunter-foragers, 13 per cent to herders and stock raisers, and 17 per cent to people with an organized economy (farmers, livestock breeders, and the like). 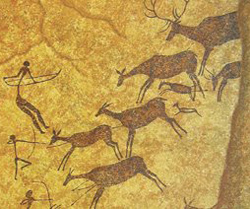 The cave art of all social groups consists of five principal motifs: human figures, animals, tools and weapons, rudimentary local maps, and symbols or ideograms.These motifs occur on portable objects (engraved, sculpted or claymodelled) and immovable surfaces (rock paintings and engravings). Early farming communities depicted their view of the area in which they lived. So-called topographical compositions include animal pens and "maps" of villages and, later, towns. In Valcamonica, several of these constitute the most ancient maps known in Europe, such as the Bedolina Map. In this example, it is possible to make out cultivated fields, access paths, houses, and other topographical details. One large composition found at Okladnikov on Lake Baikal (Siberia) includes human figures and areas filled with squares or circles in solid or dotted lines, which are suggestive of a harvest scene. The Wall-map of Çatal Huyuk (Turkey) is unique, showing an urban settlement with an erupting volcano, the oldest documentation of such an occurrence. The Topographical Stone of Jebel Amud in the Jordanian desert, reproduces the layout of a zone comprising 150 settlements (indicated by various shapes) joined to one another by engraved paths. 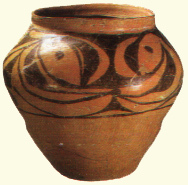 Vase decoration is a typically Neolithic art form. The first, fairly simple buff-coloured terracotta vases date from tile Peiligang culture of China (seventh to sixth millennium вс). Later findings from the Yang-Shao culture (fifth to fourth millennium вс) include vases decorated with fish and other animals and tripodal vessels shaped like owls. The figures not only had symbolic significance, but also modified the appearance of the vase by focusing attention on the decoration, the background colour contrasts, and the rhythm of the outlines. The motifs shown, although the same as those used for mural art, also assumed other meanings. By the third millennium вс, the variety of form and ornamentation of pottery was already well developed. Goblets, bowls, and covered dishes had now come into existence. In the Near and Middle East, the production of ceramics had begun by the sixth millennium DC. Simple, rough, burnished or reddish-coloured wares were made, the mouths of which formed holes. They were decorated with impressed or rolled shells and geometrical and figurative motifs. was decorated witti incised parallel lines, often infilled with dots or cross-hatching. The cave and rock art of the later Old Stone Age or Upper Paleolithic (which ended in about 10,000bc) is especially famous and has certain particular characteristics. In these oldersites, large pictures of animals are only rarely associated with human figures, whereas in more numerous. Within sites, one animal may be more frequently represented than others. Some animals may be restricted to certains parts of the cave, others may occur throughout. Animal associations vary but compositions including particular pairs of animals, such as bison and horses in Europe or elephants and giraffes in Africa, are known. On both continents mythical beasts including half animal, half human creatures are occasionally depicted. Portraits of people are rare and landscapes, plants, fruit, and flowers are unknown. 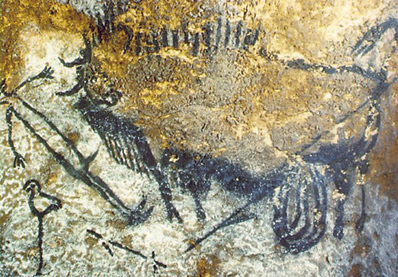 In Africa, south of the Sahara, and in present-day Tanzania (Kondoa and Singida in the Rift Valley), ancient hunters left black and yellow paintings and graffiti in granite caves and sandstone galleries. Later polychrome works are also found here, including ideograms, paintings, handprints and rare human figures, together with the traditional association of elephants and giraffes. 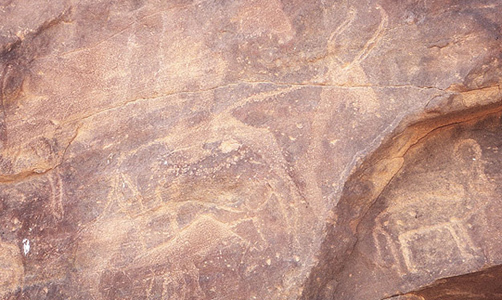 In densely inhabited North Africa, art is found on rock walls at the root of mountain massifs such as Tibesti and Tassili, now surrounded by vast deserts. In Europe, some 200 caves and rock shelters are known to contain art. The majority dccur in France and Spain, and a few in Italy, Portugal. Romania, and Russia. The oldest sites are attributed to the Aurignacian period (36,OOO-3O,OOObc). It is notable that paintings and figurines of this phase often depict dangerous animals such as lions, bears, hyaenas, and woolly rhinoceroses, as well as humans, horses, and other food animals. Handprints and dot motifs also appear. The colours used were produced from ochre (reds and yellows), manganese dioxide (violet and black) and charcoal (black). These minerals were pulverized on stone palettes and mixed with animal fat to moisten them before they were applied with the fingers, bone spatulae or brushes. Stone engraving tools known as burins were used to engrave and carve portable works. In the later European periods of the Solutrean-Magdalenian (24,000-12,OOObc), large low relief sculpture, engravings, clay modelling, and big compositions including many animals are characteristic at sites such as Roc-de Sers, Lascaux, and Niaux in France. In some sites like Altamira in Spain (the first example of cave art to be discovered), wooden scaffolding must have been used to paint the remarkable friezes on high walls and ceilings. 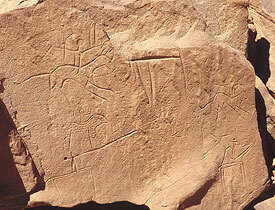 In the Near and Middle East, Paleolithic art made its first appearance prior to 12,000вс. 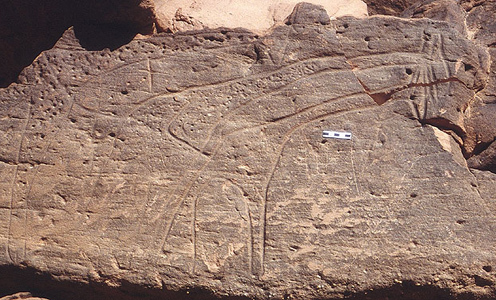 Archaic hunter-foragers of central Arabia left art in the form of shallow to deep engravings, while, in India, some of the rock paintings of the Vindihya Hills may date from about 14,000bc. However, many of the earliest depictions drawn in yellow have been over-painted with scenes in red dating from the Bronze Age and white historical pictures. The red paint was obtained from plant stems and leaves. 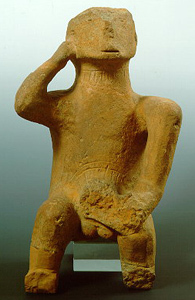 Clay idol representing an ithyphallic seated man, found in Thessaly. In temples dating from historic times, structures and images may be superimposed over one another. The same happened over periods of thousands of years with inscriptions and paintings on rocks in the open air or deep in caves. This may signify a spiritual need to establish a sense of continuity. In many sites, there are examples of multiple superimpositions, dating from prehistory to modern times. They range from Valcamonica in Italy to sites in Australia, where ancient compositions are worshipped to this day and sometimes "freshened up" for new ceremonies. 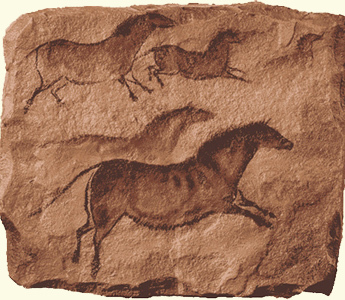 Animals are to be found everywhere in prehistoric art. being the favourite subjects of hunters, herdsmen, and breeders. We can recognize species and breeds that still exist today. These pictures also furnish us with precious contemporary documents of animals now extinct from the region of the paintings, such as the cave lion, bear, sabre-toothed tiger, mammoth, Ilomoicerus (large-horned buffalo), and giant deer. 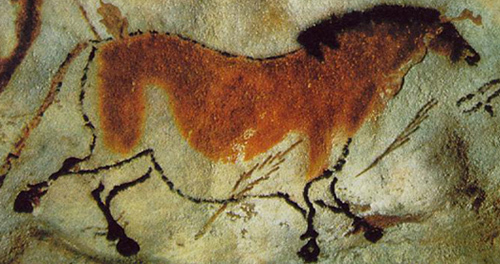 There are elaborate paintings of animals in the cave "sanctuaries'' of France and Spain and in open-air shelters all over the world. In Europe, the animals most often depicted were horses, bison, mammoth, reindeer, aurochs, wild boar, fish, eels, birds, and other animals valued for food and raw materials such as fur, leather, antlers, and ivory. In Tassili and Tibesti in Africa the teeming fauna of rivers and lakes (hippopotami, crocodiles, fish, and birds), the plains (cattle, goats, and sheep), and the savannah (elephants, giraffes, and rhinoceros) is brought to life on rock walls. 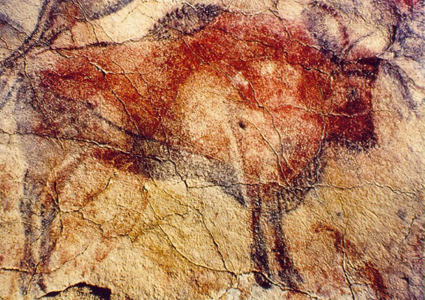 Among the most prized animal images are those at Altamira, near Santander in nothern Spain. There are life-size images of bison, as well as naturalistic portrayals of stags, wild boar, and wild horses. In Australia, the Murray culture (20,000-8,000bc) and the Panaramitee culture (10,000-3, ОООвс) produced notable ideographic engravings. In Patagonia (the southernmost region of South America), the "Toldense" people covered their caves and shelters with handprints. After about 12,000вс, a new sryle derived from Africa and depicting numerous humans and smaller animals appears in the Spanish Levant and Italy. This coincides with a phase known in Europe as the Mesolithic, a period sometimes regarded as transitional between Paleolithic hunting and foraging and the earliest phases of farming referred to as Neolithic. Scandanavian pictures of this period and the Neolithic include depictions of boats and skis. In North Africa, the period 12,000-бОООвс also sees the introduction of branches, fruit, and leaves into paintings with people and animals. Drawings changed to reflect the change of environment which caused the spread of the desert and the extinction from these areas of elephants, giraffes, lions, rhinoceroses, and crocodiles. They also show the introduction of domesticated dogs, cattle, sheep, and goats as the hunter-forager economies were replaced. South of the Sahara between 5,000 and 1,000bc, representations became more naturalistic and identifiable. The outlines are particularly precise and expressive, but the figures of elephants, deer, giraffes, and other wild animals still represent archetypes rather than particular individuals of the species. As a part of an unbroken artistic tradition, rock art in sub-Saharan Africa continued into comparitively recent times. The tradition has also persisted in Australia where it still fulfills important social and spiritual functions. Prehistoric art, in general, can be seen as the representation of a symbolic system that is an integral part of the culture that creates it. It is therefore not readily intelligible or accessible to other cultures. The symbols often appear ambiguous, and it is likely that they have also changed in meaning within the same culture that originally produced them. Hands arc frequently encountered in Upper Paleolithic cave art. Prints were obtained either "in positive", by pressing the hands, smeared with red, white, or black, over the wall surface; "in negative", by outlining the hands in colour; or in "pseudo-positive", by outlining the hands in one colour and pressing them against the wall, which was painted with a different colour. They are almost always left hands (the right hand was used for painting) and often female (for example, at Patagonia), with the fingers sometimes appearing mutilated (Laussel and Gargas in France, El Castillo in Spain) or confined to the nails at the end of a long arm (for example, Santian in Spain). At times, the hands are of children (for example, at Gargas, Les Combarelles, and Le Postel in France and Altamira in Spain) or of babies (Lascaux in France). Interpretations vary: they may be symbols of possession or marks of rituals and ceremonies. Handprints dating from the early Neolithic have been found at Catal Huyuk in Turkey. 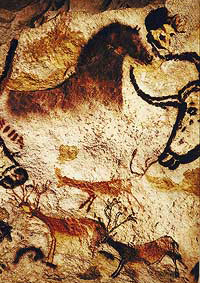 In all cave art, from the Aurignacian onwards, abstract motifs are found alongside human and animal figures, and are given equal prominence. Abstraction arose from the need to represent, in a sign, an idea with a meaning unknown to outsiders, and it -was achieved either simply or symbolically. Paleolithic people practised abstraction in the form of repetitive symbols, which represented primitive logical constants that were widely shared and diffused. These included schematic figures of animals, signs of vulvas and phalluses, handprints, series of dots and notches, which possibly had a numerical significance, and the occasional stylized anthropomorphic symbol. Other representations were grouped in similarly associated sequences. These take various forms: pictograms, mythograms, schematic figures or barely indicated figures of humans and animals, ideograms, abstract repetitive signs - such as arrows, sticks, tree shapes, discs, crosses and "V" shapes, parallel lines, series of dots - and psychograms, signs that have no obvious reference to objects or symbols. The oldest portable art from Russia and central and western Europe includes carvings of animals such as bears, lions, and mammoth, as well as remarkable human figures, including one with a lion's head from Hohlensteinstadel, Germany. These figures were made from bone, antler, ivory, and stone. Spearthrowers were the most effective hunting devices before the development of the bow, and carved and decorated examples of these have been found, The technique of working in these materials gradually became more accurate. Simple incised and dot decoration began to appear on equipment and personal ornaments, such as pins and pendants, which began to appear more often. The period between 30,000 and 20,000bc is most noted for images of women. Generally characterized by large breasts, stomachs, buttocks, and thighs and exaggerated pudenda, these figures represent women in all of the stages of their lives: pubescence, pregnancy, childbirth, and the obesity of later life. Only rarely do they have faces, such as the lovely portrait head on the Brassempouy "Venus", found in France, although they often show individual touches in their hairstyles and jewellery. "Venuses", as archaeologists have called the more detailed female sculptures, are more common outside France, especially across Russia, and some particularly fine examples have also been found in Germany and Italy. Later portable art is noted for its more naturalistic representations of animals on items of everyday equipment and personal ornaments.